Double-click on any word for a definition or more information! ISIS and its Expansion 6: Boko Haram cont'd. 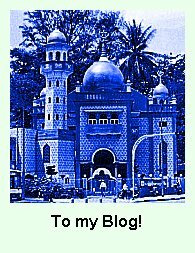 This a collection of blog articles that I uploaded between Nov. 14 and Dec. 9, 2015, occasioned by several terrorist attacks, specifically a number of bombings and one incident of mass murder with guns. One or another militant Islamic group, each of which claims to be the representative of true Islam, has taken credit for them. However, Islam is not of one cloth; it has many divisions and interpretations of the Qur'an. 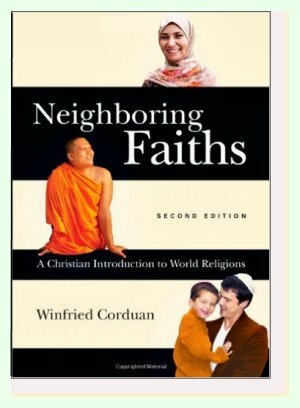 Please see my website Groups of Islam and read chapters 3 and 4 of Neighboring Faiths (2nd ed., InterVarsity Press, 2012) for a more general overview of Islam as well as descriptions of various sects that are not directly relevant to this discussion. My overall purpose is to help my readers understand the religious aspects of the groups involved a little more. Obviously some people know more about all of this than I do, and--as always--kindly worded constructive criticism is welcome. I'm retaining the headings of each section along with the date on which they were posted. Actually there were two series. The first series is entitled "Militant Islam," and I put it together when the group ISIS carried out several bombings in Paris because I thought it might be a good idea for people to be reminded of who ISIS is, and to do that properly I needed to give a short summary of the relevant history of other contemporary militant groups. To some extent I copied and pasted from some previous blog entries, but I added a few new thoughts and, hopefully some clarifications. In fact, this summary will also depart from the exact wording of the original posts from time to time. I wrote this piece [i.e. "Militant Islam"] as a single entry, but when I was done I realized that it was far too long, and so I split it into three posts, which I uploaded on the same day. Then I returned to my ongoing series in mathematics concerning the Golden Ratio and the number phi, but did not make it past one entry, when there was an al-Qaeda sponsored bombing in the country of Mali, and I felt that I needed to add further information. The second series has six parts. Its aim is to show how a group like ISIS can exert political power without their direct presence. My main illustration is based on Nigeria and the terrorist group Boko Haram that lives and works in that country. Islam in Nigeria is probably not all that well-known. Consequently, once I got started I realized how much background was needed and how much I needed to learn in the process. Thus, the latter entries were akin to a research report, though not a very weighty one. As I try to do in all of my compilations, I will retain the more informal writing style of blog entries. And, although I have tried to curb my tendency to explain by providing far-ranging thoughts or pieces of information (some would call them digressions or stacking), you will find them in sufficient number to recognize my stream of consciousness. Current events have created the need to interrupt my series on phi, and I suspect, were it not for the reason why, there could just be a few sighs of relief from my loyal readers. Disloyal ones, if I had any, would not even have tried to get through what I have posted along that vein. But I will get back to math shortly; in fact, I have an entry kr all written out, but this topic should take priority. Yesterday (Friday) afternoon I once again visited the class on world religions at Taylor University, which is taught by Dr. Kevin Diller. As I did last year, I gave an overview of radical Islam, beginning with the clashes about who would become Muhammad’s successor and ending up with the Taliban, Al-Qaeda, and ISIS. I also once again tried to include the point of view of Aïsha bint Abu Bakr, one of Muhammad’s widows, who exercised a great amount of influence on the events following Muhammad’s death and the formation of the Hadith, the narrative supplement to the Qur’an. Furthermore, it is impossible to understand Aïsha’s life and actions and gloss over the conflict and violence that already characterized the very first generation of Islam’s existence. How sad that, just a few hours later, as we turned on the news, we got an audio-visual lesson on militant Islam and the terrorism it engenders! ISIS carried out several simultaneous bombings in Paris, demonstrating its devastating reach into Western countries. In this set of three entries I’m combining much of what I posted last year as a background for being aware of ISIS with the material from the above-mentioned Aïsha lecture. ISIS was not yet in existence when I wrote the second edition of Neighboring Faiths, and last year’s entry on Aïsha, which had more details than the book, is no longer accessible due to an apparent corruption of my code. The current edition of Neighboring Faiths has two chapters on Islam, the second one being devoted entirely to the radical movements. So, if you would like further information on what I’m writing about here, you’ll find a lot of it—with painstaking documentation—in chapter 4. Also, please visit my lengthy website Groups of Islam for more background and some details that I cannot go into now. Please keep in mind that most complex scripture-based religions expect to be the only religion at the end of time; therefore, global ambitions per se should not be considered unusual or the mark of an invidious religion. However, there are important differences in the means of getting there. Spreading a faith by works of mercy, verbal proselytization, or relying on the direct action of God is not the same as conquering the planet for your religion by physical warfare. If you’re familiar with my previous writings on the subject, you already know that, various protestations by Muslim apologists notwithstanding, some Islamic groups subscribe to the latter method—and do so openly and without expressions of regret, let alone apology. They include both al-Qaeda and ISIS. The biggest division within Islam is, of course, the split between Sunna and Shi’a, and it began right after Muhammad’s death. Who among those who had been his Companions (Sahabi, an honorific title as well as a descriptive noun) would lead the new community (al-umma) established by the prophet? Muhammad’s son-in-law, Ali ibn Talib, not only seemed to have the inside edge, but also claimed to have received Muhammad’s designation and his spiritual powers. Nevertheless, the consensus (sunna) went with Abu Bakr, Muhammad’s close friend and the father of Aïsha, of whom we will say more shortly. The rulers of the Islamic world became known as the “caliphs." Thus we have the majority, the Sunna, represented by Abu Bakr, and the “dividing party," the Shi’a, associated with Ali. The first three caliphs, Abu Bakr, Umar, and Uthman were acclaimed by consensus. Ali finally became the fourth caliph, and theoretically the breach might have been healed, but by that time the divisions both between certain Sunni groups and between Sunna and Shi’a were already unalterably headed towards mutual bloodshed. As alluded to above, Abu Bakr had a daughter relatively late in his own life, whose name was Aïsha. When the aforementioned events occurred, she did not just sit on the sidelines to watch, but actively participated in them. I think it’s safe to assume that among the majority of Westerners who are aware of her at all, the extent of their knowledge ends with the fact that Aïsha was betrothed to Muhammad at a very young age, and the marriage was consummated when she was still far too young for such things (six and nine years old respectively are the most commonly cited ages). It has been hypothesized that in this particular instance, the reason was to make sure that Muhammad would have at least one wife who was still a virgin at the time of their marriage since all of the others were widows. If so, such a rationalization is still not a justification for the practice. However, to understand the early history of Islam, and thereby Islam itself, after we have exercised moral judgment, we need to look past our objections to the culture of the time and learn from the facts as they were reported. 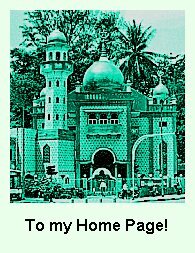 (BTW, I mention in chapter 3 of Neighboring Faiths a case where another marriage of Muhammad's, namely to Zaynab bint Jahsh, did actually violate the approved customs of his time, but that incident does not contribute to this particular discussion. I might just say that the potential controversy ended when Muhammad received a revelation on that particular point.) Along with all of Muhammad's wives, Aïsha carries the honorary title, Umm al-Muninin, the "Mother of the Believers." In her case she truly earned her place in history, and we should not ignore it. After Muhammad’s death, Aïsha--now around eighteen years old--was very concerned that Islam should stay true to the prophet’s teachings. Because of her close relationship to Muhammad, she frequently served as consultant on the manner in which he himself had practiced what he had taught. Consequently, Aïsha became a public person, who also got involved in the ensuing political matters, including the issue mentioned above of who should be caliph. Far from the common picture of the Muslim woman, isolated from the world by cloth and mortar, she took on active leadership in the affairs of the day. The honor of being the first caliph went to Aïsha’s father, Abu Bakr, so things went for her as she had hoped they would. She also approved of the second caliph, Umar (another father-in-law to Muhammad), but the political aspect of the Islamic world was heading towards great turmoil. Umar was assassinated, and the next caliph, Uthman, perhaps best known for collecting the authoritative edition of the Qur’an, was not as capable a leader as his two predecessors. An important factor that came into play was the caliph’s clan (subtribe) affiliation. Uthman came from a strong clan within the Quraish tribe, the Umayyads, while Muhammad hailed from its Hashemite segment. The Umayyads had been Muhammad’s strongest opponents and the very people who had caused the prophet to flee from Mecca to Medina (the hijra). After Muhammad had conquered Mecca, they were the last among the clans to convert to Islam. Aïsha was not alone in thinking that a member of the Umayyad clan should not be caliph. Furthermore, it appears that Uthman’s interpersonal and leadership skills were not adequate for the job. Aïsha thoroughly disliked Uthman. However, it is one thing to oppose the ruling caliph personally and politically, it is quite another to humiliate him and kill him and his family. The new governor of Egypt, Abdullah ibn Saad, did exactly that with the aid of a thousand or so rebels, perhaps motivated by his own ambitions toward the caliphate. Aïsha was outraged. She entertained a strong hope that the next caliph would take stern measures to avenge Uthman’s death. The next caliph turned out to be none other than Ali ibn Talid, which made the matter all the more awkward from Aïsha’s perspective. She did not care all that much for Ali either. For one thing, he had been seeking the caliphate in competition with her father (Abu Bakr); for another, his spine was just weak enough that he could easily be manipulated into reversing his decisions, sometimes as though it were on a whim at the very last moment before he was going to do something. Ali did not prosecute those thousand men who had abused Uthman. The reason for his inaction may have been that it was not possible to identify the specific people involved; they had found refuge in the anonymity of being soldiers in Ali’s army, of which there were several thousand. For Aïsha, Ali’s failure to do anything in this case was another sign that he was no more suited for the position of caliph than Uthman had been. There was another complication. In this, the fourth, round of choosing the caliph, Ali still had competition. It came from a man named Muawiyah, another member of the Umayyad clan, who thought that he was entitled to the Caliphate primarily because of his tribal status. So, both Ali and Muawiyah were odious to Aïsha, but she was particularly angry at Ali for letting the mistreatment of one of Muhammad’s Companions (i.e. Uthman) go unpunished. Taking Aïsha out of the picture did not uncomplicate matters very much. The big question between the followers of Ali and Muawiyah was, "Should the caliphate belong 1) to someone who was highly regarded in a particular tribe or b) to a descendant of the prophet?" A third group, called the Kharijites (“Dissenters") emerged with the message that neither criterion was true to Islam. They observed that it had hardly been a bare thirty years after Muhammad’s death, and already the people had lost their way, treating the caliphate as though it were a kind of monarchy. They insisted that the truest and purest of all Muslims should be the one chosen to be caliph, even if he had been nothing more than a slave boy. Descent or social standing should have nothing to do with the selection. The fact that such inappropriate criteria were being used to designate the caliph, led the Kharijites to conclude that many supposed Muslims had already become apostate. They had fallen back into the ignorance and darkness of the time before Muhammad (the jahiliyyah). If so, these lapsed Muslims were considered to be worse than unbelievers and potentially subject to execution. The story that follows is quite complicated and not easy to sort out. For example, there were several letters written attributed to some of the people involved, which the alleged writers repudiated as stemming from their pen. This much is clear: The Kharijites acted on their beliefs. When Ali started to negotiate with Muawiya rather than fight him, a group of Kharijites assassinated him. They did not think of themselves as either Sunni or Shi’ite (which were still in their embryonic states). As a distinct group the Kharijites did not last very long, but similar movements, which we can call “neo-Kharijite” have popped up again and again during the history of Islam. Please read my website, Groups of Islam, or Neighboring Faiths for more of what transpired as I will try to limit myself to only the most relevant parts here. The point is that these neo-Kharijite groups would not have arisen if Islam had been practiced in the pure, unadulterated form that they expected. Some developments within Islam went into the direction of mysticism (i.e. Sufism), as well as adaptations to folk religion and superstitions. One response to these alleged deviations came from Muhammad ibn Abd al Wahhab (1703-1792), who initiated a significant reform movement in what is now known as Sa'udi Arabia. When most of the Arabian Peninsula came under Sa'udi rule in the early twentieth century, “Wahhabism" became mandatory, and anyone who did not comply with its teachings was liable to be executed. It is a rather rigid form of Islam, forbidding anything that could be interpreted as idolatry (shirk), such as the veneration of Muslim saints or their gravesites, not even making an exception for the burial site of Muhammad in Medina. A central concept in Wahhabism is tawhid, which basically means “oneness” and refers to the one God (Allah) alone as being worthy of worship. The Wahhabi movement came about in order to purify Islam. Countries that adopted it have not been hospitable to other religions or versions of Islam, but on the whole, their initiatives have been internal. In addition to Saudi Arabia, the two other countries in which it has made its home are the United Arab Emirates and Afghanistan, where the Taliban forced Wahhabi interpretations of the Qur’an on the people for a time (and would like to do so again). But there is no caliphate in Wahhabism. The kings of Saudi Arabia claim to have a divine mandate to rule, but they do not refer to themselves as caliphs. One of the crucial tenets of Wahhabism is that no Muslim should follow human teachers in their beliefs and practices. Consequently, Wahhabis do not care for that label and prefer to be called Salafis, which means that they follow the pattern set by Islam under the first four caliphs and don't recognize later developments in Islam as true Islam. We will meet the term "Salafi" again. Whether they like labels or not, Wahhabism is clearly a part of Sunni Islam, and, if I may give you some terms without explaining them here, they are Ash’arite in outlook and Hanbalite in their shari’a. Even though Osama bin Laden (1957-2011), the eventual leader of al-Qaeda, grew up in Saudi Arabia under Wahhabi teaching, he eventually turned into a different, far more radical direction, inspired by the writings of Seyyid Qutb (1906-1966). Qutbism and its philosophical allies deny the legitimacy of any human government (including a caliphate) and look for a totally Islamic world, which will be governed by Shari’a alone. According to them, not only non-Islamic countries, but also all Muslim countries that are governed by human beings (something that might seem obvious), are in the state of jahiliyyah (darkness and ignorance). The Saudi government is not only included in that judgment, but was singled out by Osama over and over again as a case in point of such apostasy. I’m sorry for playing the same record so many times over the last few years, but I must continue to urge you to read Milestones by Seyyid Qutb. I’m certainly happy if you just take my word for the summary, but if there is any doubt in your mind concerning the utter destructiveness of some Islamic ideologies, this book should resolve it for you. The Qur’an teaches that Islam should not be propagated by the sword (Sura 2:256). People should be able to come to a free decision of the truth. Consequently, many Muslim apologists today go to extraordinary lengths to explain away the various aggressive wars fought by Muslims ever since the birth of Islam. For our purposes right now, this issue is irrelevant because al-Qaeda and other followers of Seyyid Qutb not only acknowledge that there have been Muslim wars of aggression, but advocate that they must be resumed. Qutbites agree that one should only become a Muslim by free choice when one recognizes the truth, but declare that people today do not have true freedom to make such a choice since they are “enslaved" to human governments. Thus, the primary item of their present agenda is to abolish governments, both those of non-Muslims and of the multitude of pseudo-Muslims who live within the recrudescence of jahiliyyah. In order to make a truly free choice concerning Islam, people need to live in a truly Islamic environment, and that is one in which only Shari’a is needed without people to enforce it. In short, it takes global violence in order to arrive at a state where only one ideology (Islam) rules, and then, finally, people will be free to choose whether they want to be Muslims or not. Let me repeat a point that I’ve made several times in various places in order to illustrate this idea. It has been stated multiple times that al-Qaeda’s attack on the Twin Towers on 9/11/2000 was irrational because it not only killed non-Muslims, but Muslims as well. This particular inconsistency vanishes under the Qutbite paradigm because any supposed Muslim working in the Twin Towers would surely be in the state of jahiliyyah, and, thus, be subject to destruction just as much as any other infidel. Anyone who is not a Muslim in accord with the principles of Qutb and al-Qaeda is a hypocrite, and the Qur’an destines hypocrites to a worse fate than unbelievers. Sura 4:145: “The Hypocrites will be in the lowest depths of the Fire: no helper will you find for them; --"
And now to ISIS. As announced I will not give a history of this organization (except in the sketchiest terms), nor go into all of their present machinations in detail. The Wikipedia site is flush with details and will definitely send a chill down your spine. My goal here is the rather modest one of putting ISIS on the map of Islamic groups. One very basic truth needs to be reiterated: Islam is never complete as a religion unless it encompasses a state, viz. a political entity. (For al-Qaeda, such a state would be a pure theocracy, arrived at by ungodly measures.) Thus, the fact that ISIS has the establishment of a state as its goal should not be surprising. Still, when my father and I were talking about Islam today on our weekly Skype, we agreed that neither the media nor the vast majority of politicians has yet to catch on to the fact that Islam cannot function as a private “faith,” but must establish the community (al-umma) as a state. Islam and Christianity are very different in that respect—or should be, and I don’t want to go further along that line for now. See my article "God in the Early Twenty-first Century " as well as some further explications below. ISIS is not Wahhabi, though there are many similarities. It promotes a supposedly “pure" kind of Islam. It identifies itself as Salafi and stresses the importance of tawhid, the oneness of God and the worship of him alone. Any practice that could be deemed to be shirk (idolatry) must be eliminated. But none of these matters require any link to Wahhabism other than a conceptual one. By engaging in aggressive warfare in order to expand its boundaries and killing Muslims as well as non-Muslims for merely political reasons, it goes far beyond Wahhabi ideology. And, for that matter, so does the genocide of non-Muslims in the name of a totally manufactured war, which includes women and children, utilizing some of the worst tortures ever invented by human beings on the lowest rungs of depravity. Christians and Yezidi are easy targets for them; consequently there is now a growing community of Yezidi refuges in Germany. Please see my post about the Yezidi. Nor is ISIS Qutbite. The movement did arise out of al-Qaeda with its underlying Qutbite ideology, and it definitely shares Qutbite radicalism in designating all other Muslims to be in a state of jahiliyyah and, thus, making them legitimate targets of aggressive war. But al-Qaeda and ISIS could not coexist for long since ISIS is all about setting up a new government now (their Caliphate), while Qutbism eschews all forms of human government. In the matter of persecuting Muslims, ISIS has emphasized fighting against what they are calling “Shi'ite oppression." This notion would be laughable if it were not accompanied by such inhumane violence and brutality. It is true that since the American involvement in Iraqi politics the Shi’ites have had a greater amount of authority in Iraq than in most of Iraq’s history. However, Shi’ites do represent a majority of Iraq’s population, and, as I stated above, they have lived almost perpetually under Sunni governments. ISIS considers itself as neither Sunni nor Shi’ite, just as was the case for the Kharijites in the seventh century, but their main victims within Islam are the Shi’ites. Outside of Islam, it appears that anyone else is fair game for persecution. Most significantly, in contrast to both Wahhabism and Qutbism, ISIS has resurrected the position of caliph. Thus, at this moment, they occupy a unique slot. Once again consulting history, after the initial skirmishes, the Umayyad dynasty held the caliphate until it was replaced by the Abbasids in 750. The only territory to which the Umayyads held on was Iberia, and they continued to designate their leaders as caliphs. Thus there was the truly powerful Caliph of Baghdad and the vestigial Caliph of Cordoba. The Abbasids eventually lost power, and in the eleventh century, the strongest caliphate was held by the Shi’ite Fatimid dynasty in Egypt. Thus, there were now three caliphs, the Caliphs of Baghdad and Cordoba—both of them dysfunctional—and the Caliph of Cairo. After the Ottoman Empire had consolidated the Muslim world under its rule, the Sultan also bore the title of “Caliph." The revolution by the “young Turks" in 1922 (that’s where the term originated) ended that practice, and, after several failed attempts to sustain the position in some way both inside and outside of Turkey, since 1924 there has no longer been a caliph of global recognition. I must add here, though, that caliphates in smaller settings are not unheard of, as I shall discuss in a future post. ISIS has now attempted to revive the caliphate on a global scale. Its present leader goes by several names and titles, and I will only touch on a few highlights. Born as Ibrahim Awwad Ibrahim Ali al-Badri al-Samarrai, he is the Emir (“prince" or “ruler") of ISIS. His popular name has been Abu Bakr al-Baghdadi, and you will immediately recognize the importance of “Abu Bakr" in that construction. Lately he has added “al Qurashi" to his title, implying descent from the prophet, who, you remember, was of the Quraish tribe. The shortest version with which one can refer to him is “Caliph Ibrahim." Note: Much of the above is taken from the earlier posts with some modifications. I have not changed the passages below (except maybe for some spelling or punctuation mistakes) because it seems to me that matters have not changed all that much. ISIS has grown over the last year. Has there been progress in putting a halt to it, other than some trophy killings among their leadership? ISIS displays all of the worst traits associated with the stereotypes of Islam, and in a world where it seems to be impolite to call an evil person "evil," surely this organization and its leader deserve that appellation. The U.S. has taken the lead in attempting to put an end to the travesties of ISIS. I’m not fond of the idea of the U.S. being the policeman of the world, but such a horror cannot be allowed to go on unimpeded. Some European countries have now joined the American effort, and the new Iraqi government is attempting to put an end to ISIS. Perhaps together they will succeed. Also, other Muslim countries have denounced ISIS. And that last remark once again brings me to a rhetorical question that I have repeated several times. Why are the so-called moderate Muslim nations not playing a more active part in the war against ISIS? For Muslims to sit on their hands while they make frowny faces and verbally dissociate themselves from ISIS is simply not enough. If Islamic countries want to be taken seriously by the outside world, they need to earn that respect by neutralizing those groups that clearly violate the standards of Islam. Perhaps Western-style democracy is not yet appropriate for some countries where tribalism is too deeply ingrained; simply imposing it seems to backfire in many cases, though I wish it weren’t so. But even an absolute ruler can and should abide by the Qur’an if he is a true Muslim. “There should be no compulsion in religion" (2:256). “People of the Book" (e.g., Christians and Jews) must pay the unbeliever’s tax (jizya) and occupy a lower standing in society than Muslims, but they should be allowed to live and worship God in their own way (9:29). This series of entries is intended to provide some further information concerning the militant groups of Islam who are creating havoc around the world. In the first installment I’m going to refer to some remarks made by our president and secretary of state, but only to illustrate certain attitudes. This is not intended to be a political topic per se, though it has to start that way. My basic point should be recognized as non-partisan as far as American politics are concerned. the little inset informs us. Taken in any way other than the specific context in which he made the statement in question, it would have been outrageously ignorant or deceptive. However, what the president was referring to was clearly limited to the geographical expansion of the territory ISIS is claiming within the countries of Syria and Iraq. For a while now, ISIS has not been able to stretch those boundaries, and that was what Mr. Obama was alluding to. He was quite aware of and acknowledged the growth of ISIS in territory and power in other parts of the world. And that’s what I want to write about here, though I’m afraid I need to address some more matters beforehand. Someone else will come along, maybe not immediately, to fill Osama's shoes, and the fact that we don't know yet whether they will be sandals, wingtips, or boots introduces a dangerous element of uncertainty. His death is a setback for al-Qaeda. But only a setback. There are too many people, too many cells, too many individuals whose brains have become pickled with Qutbite rhetoric for anything to have changed in the long run. I'm afraid that we have not heard the last of al-Qaeda and its nefarious activities. This is my opinion, and I can't imagine that too many people would seriously think otherwise. Well, of course I was wrong. Some people have attempted to convince us otherwise. The Obama administration has attempted to use the assassination of bin Laden as a license to claim that they had overcome al-Qaeda. It took us quite a few year before we were able to eliminate Osama Bin Laden and the top leadership of Al-Qaeda and neutralize them as an effective force. We hope to do Daesh much faster than that. We think we have the ability to do that. The statement was preceded by a caution that dealing with these terrorist organizations takes time, and that people need to be patient. However, Secretary Kerry seems to know (I do not see how) that with regard to ISIS (Daesh) the time table will be faster. I cannot help but see his declaration as false, irresponsible, and illiterate. Illiterate: What in the world does it mean to “do” Daesh? What kind of a Secretary of State uses such street jargon in a public statement? False: The fact that al-Qaeda has not been neutralized as an effective force has been obvious to most of us for quite some time now and didn’t need to be confirmed by the bombings in Mali on the day after Mr. Kerry’s speech. The atrocities didn’t tell us anything new about al-Qaeda, but they did reveal that our Secretary of State appears to be out of touch with reality. And, thus we come to the important question of how ISIS is continuing to grow and become a veritable rival to al-Qaeda. I am beginning to realize that, once again, this matter is going to take more than one installment, and I am running out of steam fast. Working through the political material took more out of me than I had anticipated; it takes a lot of energy for me to write in a civil manner about Mr. John Kerry, the person and the politician. Next time, I’m going to bring up certain events in Nigeria as a case in point of how ISIS is increasing in power and influence. As usual, I did not intend to wait as long between entries as I did, particularly since I knew pretty much what I intended to write. However, once I started to pursue sources of information, I got caught up in the chain of interlocking events and their accounts and felt that I had to learn a whole lot more before putting my thoughts into words. This post is only the beginning of what I’ve written over the last few days, and hopefully I will get another entry ready very quickly. In writing a blog entry, judging when and where to include references is not as straightforward as it would be in writing an academic paper, so I’m going to give you some of my best sources on the topic here and then provide links or abbreviated notes in cases of direct reference. Toyin Falola. Violence in Nigeria: The Crisis of Religious Politics and Secular Ideologies: Rochester, NY: Rochester University Press, 1998); Nehemiah Levtzion and Randall Pouwells, eds. The History of Islam in Africa (Athens, OH: Ohio University Press, 2000). Both of these books were written before the public emergence of the Nigerian group known as Boko Haram, which is a positive point for me. It is all-too-easy to view history in the light of present events and, thereby ascribe significance to them that they might not have had at their time. In the last entry I stated that, to the best of my knowledge, President Obama was correct when he claimed that ISIS, the radical Islamic group, has been contained in its area of origin, namely Syria and Iraq. Still, Isis is growing in power and geographical proliferation. How is that possible? The answer is rather simple. In various parts of the world other radical Muslim movements are pledging their allegiance to ISIS and to Caliph Ibrahim, their leader. Recent events in Africa can serve as an example. The African country of Mali was recently in the news because of the al-Qaeda sponsored bombing of a hotel. How many of us needed to look at a map, however briefly, to remind ourselves of the location of Mali? I suspect that there may have been quite a few people in this country—though obviously excluding my always-well-informed readers—who were not even aware that a country named Mali existed, let alone where on the globe its citizens pursue the quest for their daily handful of millet. How many among us knew or remembered that its capital city is called Bamako? Not I. I must confess that the only name of a city in Mali that I could have readily identified is Tombouctou (better known as “Timbuktu”), which once upon a time was a rich and thriving center of trade, one of several hubs on the route connecting the Arabian Peninsula with West Africa. Timbuktu also figures largely in the accounts of possibly the most outstanding 19th-century explorer of North Africa, Heinrich Barth. 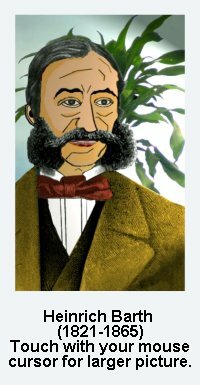 (For my German readers: Es ist unmöglich, die Berichte des Heinrich Barths zu lesen, ohne den Eindruck zu gewinnen, dass er dem Kara Ben Nemsi sozusagen Pate gestanden hat.) It is telling that in American slang “Timbuktu” has taken on the meaning of “way out there, about as far from our locality and civilization as you can get,” a characterization that unfortunately covers up its historical importance. Well, we’ve become (re-)educated as to the existence and locations of Mali and Bamako. I’m not terribly grateful, though. There are better and pedagogically more preferable ways of learning geography than by tracing the activities of terrorist groups, but we have been forced into it. And, furthermore, we probably should work on remembering the names of African countries and cities. Events on that continent will very likely have an increasingly powerful effect on the rest of the world in the not-so-distant future. Let us move a little further south from Mali and look at what is happening in Nigeria. Looking at the figures given in the Wikipedia, Nigeria has become a country to be reckoned with when it comes to its impact on the world. Alas, unless it will find a way to establish political stability, a backward slide is a strong possibility. Centuries ago, the large area that we now call Nigeria hosted multiple kingdoms and several larger empires prior to European colonization. According to the numbers supplied by the Wikipedia, its total population now is 182 million which gives it first place in population size among African countries and eighth place in the entire world. Similarly, its economy is (or perhaps has been until recently) ranked as the twentieth in the world and the largest in Africa. Given those numbers, what happens in Nigeria cannot help but have an impact onto the world. Christianity came to Nigeria for the most part by way of Europeans. Although the officially announced policy of Great Britain was to abstain from interference in local governance and religious practices, Nigeria was opened to Christian missionaries, who came and evangelized, aided by works of mercy, such as medical care and education. It was inevitable that many Nigerian people picked up Christianity, the religion of their more advanced colonial supervisors, in order to attain success similar to theirs. The geographical and political divisions of Nigeria are complex and are increasing as ever-new states are created by a process of balkanization. But a general pattern emerged by the beginning of the nineteenth century that is still visible on a simplified map. and Abuja, the capital (center). Speaking then in overly general terms, the northern region of Nigeria is predominantly Muslim; much of the population consists of Hausas, a Berber group, and the practice of Islam has been quite orthodox on the whole. The smaller southern area is best seen as divided into three subareas. The Western area is home to the Yoruba, most of whom have now officially abandoned their traditional religion in favor of Islam. However, in contrast to the northern Muslims, the Yoruba have tolerated a certain amount of syncretism and greater diversity in Muslim practice. The Igbo, who are now primarily Christians, live in the Southeast; they dominated world news in the late 1960s because of their unsuccessful attempt to secede from Nigeria under the name of Biafra. The ensuing war and sanctions contributed to the death of an estimated one million Biafrans. Their territory is crucial to the entire country’s economy due to the presence of large oil reserves. Finally, between the two flanks there is the corridor labeled as “Midwest.” As I understand it, in this region one may find the largest number of well-educated people, who wish to model Nigeria on European states. Along with those aspirations comes at least a nominal commitment to Christianity. No area is entirely “religiously pure,” and Christians and Muslims are found to various extents in areas where the other group dominates. Following patterns set in all too many locations around the world, minorities in a given region may be subject to discrimination and persecution. (Furthermore, as I had to learn in order to get a "feel" for Africa a couple of decades ago, we must always remember that traditional religion continues to live in the hearts of many people, even when it is not outwardly visible, but that's another story). After consulting a number of sources, including some written by Muslims, and allowing for a reasonable number of exceptions, I find that it is fair to say that Muslims in general have advocated turning Nigeria into a Muslim state, governed by shari'a, while Christians have maintained that Nigeria should be a secular state in which there is room for both religions. Due to the legacy left by the British, particularly immediately after independence, governmental positions had been filled more often than not by (at least nominal) Christians. More as soon as I can get it together. We are working towards a clarification of ISIS and its satellites, using Nigeria as an example. Please forgive me for beginning this entry with a statement that I have made numerous times here and elsewhere. It is of utmost importance in understanding the nature of Islam and, consequently, a difference between Christianity and Islam. Christians are exhorted to live in submission (which is not synonymous with blind obedience) to whoever constitutes their government, while Islam is never fully realized until Muslims live in an Islamic state. The apostle Peter reminds his readers (1 Peter 2:11, 12a HCSB) that they are no longer truly at home in this world. Dear friends, I urge you as strangers and temporary residents to abstain from fleshly desires that war against you. Conduct yourselves honorably among the Gentiles …. Maybe it's a paradox at first glance, but it is precisely because Christians are aliens in the world that Peter urges them to be exemplary citizens wherever they may find themselves. Christians should recognize the authority of a government even if it is ungodly. Who would fit that description better than the Roman emperors of the first century AD? Still, Peter states in 1 Peter 3:13-15 (HCSB). Submit to every human authority because of the Lord, whether to the Emperor as the supreme authority or to governors as those sent out by him to punish those who do what is evil and to praise those who do what is good. For it is God’s will that you silence the ignorance of foolish people by doing good. As mentioned above, the word “submit” does not entail unquestioning compliance with a state if it demands participation in an action that is clearly contrary to scripture. However, in that case we may have to accept suffering, as Peter clarifies throughout chapter 4 of his epistle. In a democracy we should voice our criticisms of the government when it does wrong and take whatever actions are available to promote the right. However, the idea of a Christian theocracy is not found in the New Testament, let alone promoted in its pages. To be sure, we are looking forward to a true theocracy when Christ will rule on earth during the millennium, but that event will occur in God’s own timing by his initiative and his actions. We are not exhorted to establish the kingdom of Christ on earth before his return. – I am fully aware that many American Christians either do not understand this fact or do not want to accept it, promoting a veritable "Christian" political hegemony. They have apparently not yet come to terms with our basic identity as temporary resident aliens in a fallen world. On the other side of this coin, genuine Islam demands an Islamic government, a condition that cannot be fulfilled by a “Western style” open democracy. 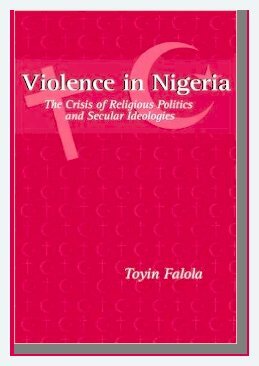 Toyin Falola provides several quotations from people with different outlooks on Nigerian religious policy in the front matter of his book, Violence in Nigeria. The first such paragraph comes from a Muslim publication, which—ignoring the strident tone of this quotation—does represent a basic Islamic dogma. I suppose that I could soften this statement a little by using another noun other than “dogma,” such as “perspective,” “opinion,” “preference,” etc., but doing so, even if it were to sound “nicer,” would be tantamount to concealing a crucial part of Islam. The statement comes from the Muslim Student Society publication, Radiance. An easy response to this assertion is that the Muslim conquests and the imposition of Islam on non-Islamic areas constitutes a perfect example of such a cultural/political upheaval and the survival of its people (particularly if we ignore the hundreds of thousands of slaves captured and sold during those times). In Nigeria the expansion of Islam in its most successful times included the eradication of previous religions, cultures, and principles of law and government. Islam has been in Nigeria longer than Christianity and Western secular thought, but it can no more claim to be truly indigenous than any other religion except for those associated with the local tribal cultures, such as that of the Yoruba. In any event, it is Islamic dogma that Islam is not fully established in any location until an Islamic government is in charge. The reality of this dogma is supported both by the historical example of Muhammad and the early caliphs (the Salafi), for whom the spread of Islam as a religion and as a political entity were synonymous. It is also borne out by various verses in the Qur’an (Yusuf Ali translation). They are your brethren in Faith. There is much that one could say by way of commentary on these verses. Al-jizya refers to the "unbeliever's tax" that Christians and Jews are required to pay for the privilege of living in an Islamic state (while being exempt from the zakat.) For "pagans" and lapsed Muslims, there is no such provision, and we have seen many examples recently that some militant Islamic groups ignore the Qur'an's exhortation to make this allowance. Suffice it for us at the moment to recognize that the establishment of a society regulated by five mandatory times of prayer (al-salat) and the regular collection of alms for the poor (al-zakat), alongside the oppression of the People of the Book and their submission, would not be possible if Islam would not have governmental powers. A potentially better case for Nigeria to become a Muslim state is also illustrated in the above quotation with the phrase "a great majority of its people." If the citizens of Nigeria were overwhelmingly Muslim, then, perhaps the establishment of an Islamic system of governance would become a legitimate demand. However, given the available plausible data there is no Muslim majority in Nigeria as a whole. Numbers describing the Nigerian population are notoriously unreliable. (See the appendix of Falola, Violence in Nigeria.) Different segments of tribal, geographical, or religious affiliations are likely to report the highest possible believable numbers—and sometimes overshooting the plausible. One motivation for reporting higher figures may be that they may result in greater allocations from the federal purse. After looking at various sources for numbers and their plausibility, I can say this much with a certain amount of assurance: The two largest religions in Nigeria are Islam and Christianity. It is likely that Islam has an edge over Christianity with a population of over 40 percent of the people, but not a mathematical majority. With a similar degree of probability Christianity can claim a number that is also over 40 percent, but a few digits behind Islam. Such conservative estimates are not beyond dispute. However, we can be fairly sure that the larger the claims are, the less plausible they are as well. Furthermore, even if there were a decisive majority of Muslims in Nigeria, it would be made up of factions that are seriously antagonistic to each other. The largest split places strict Sunni Muslims on one side and all other Muslim groups, such as Sufi brotherhoods, Shi’ites, Madhiyyas, and syncretists, on the other. These groups differ in various ways too numerous to enumerate here, but, most importantly, they would not agree on what an Islamic state would look like other than a vague generalization that it would be governed by shari’a, the Islamic approach to jurisprudence, rather than by British common law. Even stipulating a demographic skewed heavily towards Muslims in Nigeria, it would still be doubtful that a majority of them would favor a Sunni caliphate over other forms of governance. Perceptions of the ratio of Muslims to Christians are likely to be affected by the immediate surroundings in which a person lives. Depending on one’s state of residence, one could fall into the trap of thinking that what applies to the present locality is true for the rest of the nation. As mentioned above, different regions of the country and different segments of the population are frequently dominated by either Islam or Christianity/Western-style secularism. Two of the most thoroughly Islamic regions in Nigeria are the states of Sokoto and Borno. Both of them have a lengthy history as Islamic countries prior to colonization. Sokoto was known in the nineteenth century as the “Caliphate of Sokoto,” and Borno was usually referred to as the “Sultanate of Borno,” but also took on the title of “Caliphate of Borno” a few times. Historically, the two countries were frequently at war with each other, but under British supervision became provinces of the larger entity of Nigeria and are currently separate states within the federation. I am heading towards a closer look at the Nigerian group Boko Haram, once again following my pattern of spending a huge amount of time on background (not to mention digressions and stacks without which you wouldn't recognize my blog). Suffice it to say for the moment that Boko Haram headquartered itself in Maidiguri, the capital of Borno, and that its inspiration probably derives from the history of Sokoto. More very soon. I really think I will get to the intended subject with the next entry. Yet another terrorist attack, this one on our own soil in San Bernadino, CA, and apparently carried out by a husband-and-wife team—their names are Syed Rizwan Farook and Tashfeen Malik—who first made sure that their baby was safe before embarking on their rampage. At this point it appears to be clear that they acted on behalf of ISIS (and, as I am editing this entry at a later date, that appearance has been confirmed). Their target was the state agency that had been the source of Mr. Farook's bi-weekly paycheck; among its tasks was to provide help to families with special-needs children. And the time of their attack was, of all things, a “holiday celebration”—you know, as in peace on earth and good will to all. 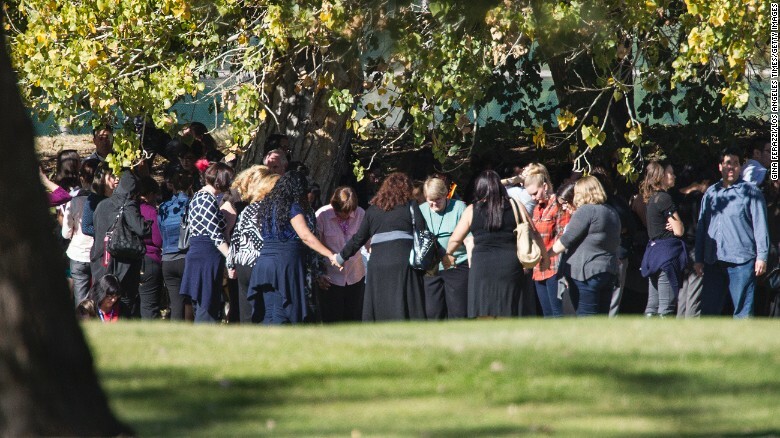 People praying on an adjacent golf course. It took the FBI a while to decide whether to classify this event as an act of terror, which may have struck you as a bit irrational with more than a dozen people dead. But there often are significant reasons not to make that decision on the spur of the moment. In this instance, since this was Farook’s place of work, he might just have had a grievance against his employer, which, he felt, could only be rectified by means of a mass shooting of his colleagues. In that case, he and Ms. Malik would still be homicidal maniacs, but not terrorists. In this particular occurrence, since the couple was killed, the immediate consequences of the label are not as visible as if they had been taken into custody. However, keep in mind the fact that terrorists are considered enemy combatants who receive neither Miranda rights nor habeas corpus nor pro bono legal representation from some hot shot lawyer who wants to make a name for himself by defending the indefensible. Moreover, the follow-up is going to be very different now since it has been established that ISIS was behind the event, and that it wasn’t just the case that Mr. Farook was angry because he had a private grievance against his employers. I would hope that it is impossible for anyone who hears or reads of this incident not to feel a great amount of anger. Let me underscore once again that Islamic acts of terrorism are considered to be acts of war. In 2001, some people were upset with President Bush for using the language of war with regard to 9/11. However, that particular matter had already been settled by Osama bin Laden himself in 1994 (a long time before 9/11/2001) when he declared a fatwa that all true Muslims should kill as many Americans as possible in the context of an ongoing war. He described the US as the head of a large association of anti-Islamic nations and asserted that eliminating the head would cause the body to fall apart as a result. Keep that image in mind when you hear about people in the sands of the Sahara, who may never have had contact with any Americans, declaim how much they hate America in general and each American in particular. Still, I pray that, as we respond to these world events, we will keep from becoming like our enemies. I confess that at times I have allowed myself to dehumanize them in my rhetoric, but doing so is not good because it can turn a travesty into a caricature. The people we are looking at are neither sub-humans, nor beasts, nor demons, nor “monsters thinly disguised as humans,” as I put it recently, but now have changed. If they were beasts, demons, monsters, or other sub-humans, it would presumably be in their nature to commit atrocities. But terrorists (and there’s no need to limit ourselves to Islamic ones) are human beings, and by their actions they show that they are evil human beings, surpassing others in their capacity to do evil even among our fallen race. If we say that they cannot help but go around killing other people because they are Muslims, we are not only stating something that’s as untrue as it is mindless, but we are also implicitly excusing their actions. After all, people shouldn’t be held responsible for something that they are programmed to do. It is the fact that they are human and that they violate their humanity that makes them such evil persons. The gravity and the moral decrepitude that we see exhibited here is so devastating because these are human beings, like you and me in many respects, but with a will that they intentionally direct towards evil rather than good. If they really could not have had a sense of the worth of human life, they would not have made sure that their baby was safe before they set out to kill others. They knew the value of a human being, but went against their most basic moral instinct. Now, having had this attack occur on US soil makes it all the more urgent that we get a grip on what has transpired in far-away Nigeria. ­­­Eventually the connection will become evident. A very prominent reformer and amazingly prolific writer was a man named Uthman dan Fodio (1754-1817; be aware of different transliterations of his given name) who lived in Northern Nigeria. After his message of calling for greater obedience to the Qur'an was rejected, he became the leader of a jihad that ended up in establishing a caliphate in the region of Sokoto. At that time it bordered on the Sultanate of Bornu, another strongly Muslim state. 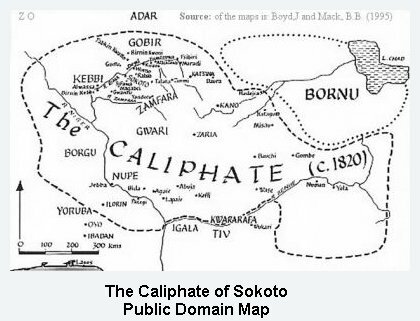 The caliphate of Sokoto lasted from about 1815 to 1904, when it was abolished by Great Britain in the process of turning Nigeria into one of its colonies. Actually, to be more accurate, they allowed the caliph to continue in a role as spiritual leader, but stripped him of political authority. 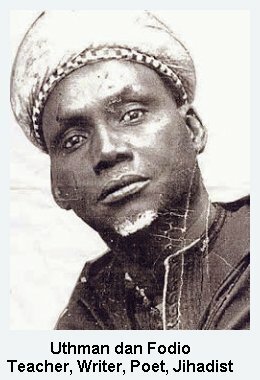 By that time Uthman dan Fodio had become a hero for many Nigerian Muslims for bringing about this allegedly true Muslim state almost a hundred years earlier. Furthermore, in the eyes of many Muslims in Nigeria, dan Fodio’s jihad and the resulting Islamic state represent the ideal that should be repeated and re-attained in Nigeria. They state accurately that the British had clipped their wings, and they exhort each other to work towards the goal of turning all of Nigeria into a Muslim state as exemplified historically in Sokoto. Islam is in a different position than some other religions because one of its underlying concepts is the mandate to establish an Islamic state, as I tried to show in my last entry. Consequently, it has a clearer set of requirements as to what would constitute an acceptable government. --- Please keep in mind that pure Qutbism, as exemplified perhaps by Osama bin Laden, aims for the immediate abolition of all governments, so what I'm writing here applies to al-Qaeda only with some with some qualifications. --- First of all, the government must be constituted by Muslims. Cooperative jizya-paying Jews and Christians are allowed to reside in the state and practice their religion insofar as it does not interfere with the supremacy of Islam in any significant way. So far so good, but where do we go from there? Presumably one could mandate prayers and pilgrimages, allow only halal (“permitted”) food to be eaten, and proceed to spell out a specific list of what else is halal and what is haram (“forbidden”). Or, one could simplify the process and decree in one fell sweep that the country, state, or region shall be governed by shari’a—Islamic jurisprudence. Please note that I said “jurisprudence,” i.e. the process by which legal cases are addressed and settled. It is not a set of crimes and their appropriate punishments per se. Some American Christians are haunted by the specter of shari’a laws being imposed on this country due to an increase of the Muslim population, not a likely scenario. Still, frequently such expressions of unease are accompanied by examples, such as adulterous women being stoned, or thieves having their hands cut off. But that’s not how shari’a works. By itself it is a method, not a book of laws. Those examples, as alienating as they are to us, are supposed to be outcomes of judicial deliberation, not overarching rules. In fact, some of the most frightful instances, e.g. the scenario in which an innocent girl was raped and subsequently executed by her brother, are not the product of shari’a at all, but miscarriages of justice that should never emerge when shari’a is practiced conscientiously. Shari’a is a rather complicated matter, and it is not surprising that there are four Sunni schools of law, which I have outlined as a part of my site on “Groups of Islam.” There’s no point in my repeating what I wrote there, but, please, read that particular page or get the information from some other source before you say anything else about shari’a. And, I might mention that fatwas issued without a preceding trial by such Muslim luminaries as the Ayatollah Khomeini of Iran or Usama bin Laden are as contrary to shari’a as a sentence being handed down without trial in our legal system would be. Shari’a can be a problem for non-Muslims, but evil people who will perpetrate injustice will not be constrained by any system, and they are the real problem. I think they would be just as evil under British-style common law, Roman/Napoleonic law, or African elder/ancestor-based traditional law as under shari'a. When the British left Nigeria around 1960, the newly founded federation faced decades of instability, and, sad to say, the right balance has still not been found. Democracies and dictatorships have come and gone, and corruption has been commonplace. We’ve already mentioned the strife between Muslims and Christians as well as the agitation between different groups of Islam, particularly between the conservative Sunnis and other groups. By the last decade of the twentieth century, finally a consensus seemed to have emerged among Nigerian Muslims, namely to unite in bringing about the one item that could theoretically engender a truly Islamic society: Muslim states should be governed on the basis of shari’a. I don’t need to point out that Christians and other non-Muslim residing in these states were quite unhappy with the idea. In some cases there may have been attempts at a dual-track systems whereby Christians were judged by a civil magistrate and Muslims by a Khadi, utilizing shari’a. 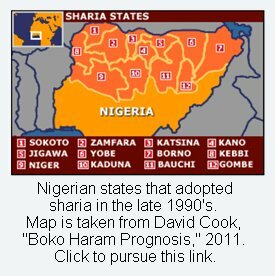 David Cook published a map of those northern states in Nigeria that helps us visualize the apparent (but only apparent) solidarity of the Muslim population of northern Nigeria in agreeing to shari’a jurisprudence. It didn’t work. Among the reasons that Cook adduces for this failure, two stand out: 1) Nigerian states do not have their own police forces. All police units report directly to the federal government, and the federal government was not interested in enforcing shari’a, especially since some of its conclusions were at odds with federal laws. So, the absence of any power to uphold shari’a in those states that tried to apply it pretty much guaranteed its failure. 2) The Sunnis of northern Nigeria adhere to the Malaki school of shari’a, and this school, the second most conservative of the four, does, indeed, prescribe stoning for adulteresses. Several cases in which women were prosecuted under that category received international attention, and, in light of the pressure from outside of the Nigerian states concerned, the fatwas could not be implemented. Of course, once one aspect of the law showed itself weak enough to be overturned, there was no good reason to expect the others to be any stronger. With the failure of essentially any possibility of enforcing the adultery laws, and the very obvious failure of most northern Nigerian states to enforce bans on alcohol and other non-shari’a activities, 10 years after the initial implementation of shari'a it is clear that no ideal Muslim society has resulted (Cook, “Boko Haram Prognosis,” 2011, p. 8). Most probably the frustration felt by the Muslims as a result of that fact has led to the rise of Boko Haram, first in Maidiguri (the capital of Borno) and then throughout the Northeast. You may never have heard of Boko Haram before, but they, too, have made the United States one of their targets of destruction. And here’s the thing we’ll pick up on next time: They are courting some powerful friends. Barring any unexpected events or questions that merit a lengthy public reply, this entry should be the last one directly dealing with Islam. Exploring Boko Haram, its background, and its potential implications, has been a learning experience for me. And it has definitely not led me to marvel at the inherent goodness of human nature. I mentioned Professor David Cook of the Baker Institute at Rice University before. Actually it was reading his summary in the glossy pages of an alumni pamphlet from the religion department that alerted me to the subject and its implications. [David Cook, “Boko Haram” Religion Matters 2 (Fall 2015):2-3.] ---Obviously, this is not the first time that I have profited from the teaching from a professor at this fabulous institution.---The insights he provided sent me off to pursue this track, and I’m glad that he motivated me to do so. As it is, the best I can produce here is a quick snapshot, when it really should take an entire movie of the length of “Gone with the Wind” to get a decent understanding of Islam in sub-Saharan Africa. I still love learning, and I picked up more than I could accommodate in these entries, but I hope that what I have done will be helpful to you to see this dimension of Islam outside of the Middle East. One of the things that I appreciate particularly about Prof. Cook’s little summary in the alumni magazine is that he did not seek to hide his feelings about the subject: the frustrations, the disgust, the disillusionment, and, at the time that he wrote the piece, the exultation over the fact that things were apparently starting to head in the right direction. Sometimes the subjective reactions become a part of the facts without which an objective account is incomplete. (It was at Rice that I really learned to appreciate the value of phenomenology.) Prof. Cook’s accounts consist of two pdf articles under the aegis of the Baker Institute: Boko Haram: A Prognosis, 2011 and Boko Haram: A New State in West Africa, 2014. They are available as pdf articles, so it is easier, once one has downloaded them, refer to them simply by their year and page number, rather than to insert hyperlinks each time. To a certain extent they are the backbone of my summary supplemented by other books and articles. However, and I don’t mean this just as the traditional formality, whatever errors I have committed or am committing are truly my own fault, and, as always, I am happy to receive kindly worded constructive critiques. In the last entry I brought up the idea, promoted by a number of scholars, that establishing shari'a (Islamic jurisprudence) in the northern states of Nigeria was unsuccessful partially because it was unenforceable on local levels as well as unenforced by the federal government. Of course, a group seeking to attain that goal could possibly defy the government and take enforcement into its own hands. The group that has become known as Boko Haram is a case in point. Aside: If you pronounce the name as “bokoe haraam,” you’re close enough to an acceptable way of saying it. Haram is indeed the same word as “harem,” that is used to describe traditional women’s quarters, and I don’t advocate changing how we say that word in English, but we should make an effort to get closer in this context. In a video to which I make reference below, I heard it pronounced in this way. So, who is this group? What are their core beliefs? What scholarly traditions of Qur’anic interpretation do they follow? We cannot say as much as we would like to in answer to the last two questions, not because we don’t know, but because there seems to be little to know. It appears to me that, beyond a rigid commitment to Islam as an unclarified exclusivist ideology and the drive to eliminate everyone who does not accept them as the only true Muslims in Nigeria, Boko Haram has shown itself to be a group in search of a permanent identity. If we try to understand its rather thin ideology, we can only do so by, first of all, recognizing that perceptions usually outstrip in radical movements, religious and otherwise. A general classification of this group places them amidst other groups that are called Salafi-jihadi (Cook, 2011, 2). The second part of the label, "jihadi," is clear enough: they do not shy away from using armed violence to promote their cause. "Salafi," as I have mentioned in the past, is not as easily accommodated. The basic meaning of the term is based on a perception of the first four caliphs (Abu Bakr, Umar, Uthman, and Ali ibn Talid), who were known as the “Companions" (of Muhammad). They have been considered to be "rightly guided," and their teaching is treated as the only true and necessary understanding of Islam. But the content derived from their teaching and role modeling is not necessarily the same for groups that use it. I noted in chapter 5 of the second edition of Neighboring Faiths that the Wahhabis of Sau'di Arabia reject being called Wahhabis and prefer to be called Salafis. Although I usually have little problem referring to groups of people by their preferred appellation, I said that in the case of the Wahhabis, the term Salafi is neither helpful nor really appropriate since there is no denying that the origin of their version of Islam lies with Abd-al-Wahhab and that, for that matter, they appear to follow the Hanbalite school of sharia. Here we see another reason: the term "Salafi" has been given to various other neo-Kharijite groups, including Boko Haram, who actually reckon Wahhabis with those who should be killed since they are tied to current power structures. The term Salafi simply does not say as much as might have been intended. In looking at whatever declarations and transcripts of interrogation I have been able to find, it strikes me that the leadership of Boko Haram has been steeped in folk Islam, but does not have a strong background in the study of the Qur'an, let alone its history of interpretation. I don't think that it is necessarily going too far to say that Boko Haram is driven by the desire to be seen as a major player in the Islamic world and might just be willing to accept any label that treats them as a major Islamic terrorist group to be reckoned with. Even more than other Muslim groups, Boko Haram’s biggest target has been "Western learning," pejoratively called Boko. Haram means forbidden, so this group became known under the negative label, "Western learning is forbidden.” Its original name was probably Jama'atu Ahli is-Sunnah lid-Da'wati wal-Jihad, "People Committed to the Prophet's Teachings for Propagation and Jihad.” Cook (2011, 8) transliterates the name as Jama`at ahl al-sunna li-da `wa wal-l-jihad and clarifies that this choice of name (i.e. Jama`at) would place them alongside other similar groups in various parts of the world. The overall strategy of a jama group is to postpone overt violence until the movement has spread itself throughout an entire country over a long period of time. Since Boko Haram’s existence began almost with violence, the name does not truly reveal the nature of the group. We need to consider another name that the group adopted a little further below. Hardly the stuff to go to war over, we might say. But things do run a little deeper than that. According to Abu Zayd, a frequent spokesman for Abubakar Shekau (Cook, 2014, 4), the group’s new leader after Yusuf’s death, explained that “Western learning” actually means "Western civilization," the perceived acme of everything that is false and perverted, in contrast to Islamic learning and Islamic civilization. Well, we could try to build a bridge and respond that we, too, do not like some of the aspects that have become a part of contemporary Western culture. But the term "boko" includes some items that we might want to acclaim as the great advances in the history of humanity, such as government by democracy. From what I can tell, from their perspective, democracy is not only a form of government in its own right, but also a deliberate means to avoid setting up an Islamic state. And Boko Haram’s entire mission is to destroy bridges. Their policy, called takfiri, falls in line with other neo-Karijite groups, as it refers to cleansing Islam of impurity by use of the sword. Concerning present rulers, Abu Zayd put forward the following statement, which astute students of logic could use as an example of the fallacy of composition. This is a government that is not Islamic. Therefore, all of its employees, Muslims and non-Muslims, are Infidels (Cook, 2011, 11). Since the United States is (rightly or wrongly) seen by many people as the strongest bulwark of Western democracy, it is the archenemy, even if it does not have a strong palpable presence in Nigeria. The Qutbi doctrine of the illegitimacy of any contemporary government seems to be highly visible. In fact, several times Abu Zayd stated as a goal of Boko Haram to render the country “ungovernable,” (Cook, 2011, 11 & 18) so that then the solution of a genuine Islamic government will be the obvious one. However, their recent support of a present caliphate does not fit in with the true agenda of Qutbism, and, just as Salafi neo-Kharijite, my favored general term is also far too general. Aside: As my ever-faithful readers know, I think that the term "fundamentalist," particularly if it is used to lump together evangelical Christians, Hassidic Jews, and Islamic terrorists, combines far too many cultural and religious forms to be anything but an empty label. Someone somewhere decided to use the term beyond its original setting, journalists and scholars picked it up uncritically, and they now debate its true meaning as an overall category as though “being fundamentalist” were an objective attribute claimed by all the of the groups in question. I would suggest that a better alternative is to drop using it outside of its original Christian setting where it has a very concrete meaning derived from the book series called The Fundamentals, published from 1910-1915. All-in all, it's probably not very helpful to place Boko Haram into any neatly designed conceptual box. Pace Hegel, in this case the real and the rational are not identical; or, more specifically for this case, the perception of the real and the rational do not necessarily coincide. The final installment should be up in just a few minutes. Continuing right where the last entry left off. After a period away from large population Boko Haram established itself in Maiduguri, the capital city of the state of Borno. Its adherents probably came primarily from Muslims in northern Nigeria, who perceived that their condition in life, frequently abject poverty, was due to having to live in a non-Muslim (many would say “anti- Muslim”) society. However, as Cook astutely points out (2014, 5-6), if so, it would still be an unwarranted stretch to ascribe rampant poverty as the cause or raison d'être for Boko Haram as an organization. The means for recruiting members frequently do not dovetail with the overall goals of a group. I don't know to what extent Yusuf used this strategy intentionally, but it certainly is often easier to rally people together under the hatred of a common perceived enemy rather than under a common cause to attain a positive goal. Ever since 2002 Boko Haram carried out armed raids, frequently in order to obtain weapons as spoils in order to arm themselves and to bolster their often-meagre finances, but also to create fear among the population as they destroyed products of "Western Learning," such as schools, churches, medical facilities, medical storage sites, and, yes, quite a few mosques. Inside of Nigeria resistance was provided almost entirely by the Nigerian police, aka Security Forces and occasionally vigilante groups (Cook, 2014, 14). Because Boko Haram frequently crossed the borders into Chad and Niger, either for raids or so seek concealment, the governments of those two countries used their armies to keep Boko Haram out of their land and hair. But they could not have an effect in stopping Boko Haram's advances in northern Nigeria. The intended goal of the establishment of northern Nigeria (at a minimum) as a separate Islamic state was slowly starting to take on reality. Only one crucial military unit, in fact, the most essential one, did not get involved, and that is--no, with all due respect, not the United States Marines--but the army of Nigeria itself. Cook points out some apparently inexplicable aspects in this set of events. One such was the fact that the Nigerian government did not act to protect schools. What is most interesting for the outside observer is that there does not appear to have been any serious security measures in place in any of these locations. For Boko Haram’s attacks to be defeated, there needs to be a system for guarding and alarm for isolated schools. It is unclear, when Boko Haram has set educational institutions as its target, why the Nigerian government and military have not responded with setting up the appropriate security measures (Cook, 2014, 12). and I’m afraid, after reading some further descriptions of the situation, that only the proper protocol of the academy kept him from employing even stronger phrasing. The news agency al-Jazeera carried an article recounting the experience of a captain in the Nigerian army who had been sent out with about thirty men to rid a town of about 200 Boko Haram recruits. They received their orders and weapons (mortars/grenade launchers) with little notice and headed out to carry out their mission. When they were sufficiently entrenched and the combat commenced, the Nigerian soldiers to a man realized that their equipment was broken and the ammunition was out of date and spoiled. On the other hand, the Boko Haram fighters were relatively well-equipped and definitely trained in the use of modern weaponry. (I'll come back to that point below.) Somehow Captain X and his men prevailed by using their handguns and actually receiving reinforcements in response to their plea. However, that's as far as the Nigerian military was willing to take their mission, a few pro forma interventions here and there, but no significant effort, while the police and military of the other two countries fought to contain Boko Haram as much as they were able. Cook describes the period from about 2010 to 2014 as a civil war in which only one side was fighting (2014, 29). I am not going to detail the many inhumane acts carried out by the group over the last few years. Please see Cook's papers and other various articles on and off line. I must seriously caution you that if you're prone to physical reactions from descriptions of torture and other violations, such as the abduction of hundreds of 10-12 year old girls and their subsequent ordeals, you should not pursue the events in a lot of detail. Still, reality is what it is, and I do need to highlight a couple of occurrences over the years. The original leader of Boko Haram, as mentioned, was one Muhammad Yusuf. It became an open secret that, whereas he was expecting all of his followers to live a highly frugal existence, he enjoyed a life of luxury and indulgence (another enigma, but one that is widespread across many different cultures and religions). On July 25, 2009, the federal police in Maiduguri captured members of Boko Haram, which enabled them to track and arrest Yusuf. Cook (2011, 11-12) provides a translated excerpt of his interrogation in the police headquarters, which reads almost like a segment from Abbot and Costello. Yusuf was manipulative, mendacious, and verging on being insolent in his initial responses. Predictably, though not excusably, his captors reacted with increased anger. They humiliated and intimidated him, and eventually simply killed him without any further process of justice. A video of what happened is posted on YouTube, but I'm not going to link to it. There’s no need for us to get desensitized to brutality. If you really need to see it, it’s easy enough to find. Needless to say, the execution of Yusuf caused a short pause in Boko Haram's activities, only to be renewed with increased vigor and a sizable increase in membership under the leadership of one Abubakar Shekau, a person who has made up for his apparent lack of knowledge both inside and outside of Islam by displaying unparalleled cruelty in word and deed. Sidelight: In early November of 2009 I had a short conversation with a Nigerian Senator, and we touched on religion in his country. At the time I had no idea of what had happed a few months earlier, and my new acquaintance, clearly a serious Christian, obviously saw no need to bring it up. I attach no significance to that fact, except that I now realize how close I was to someone whose opinion I would have valued, had I only known about the situation and been tactless enough to ask. “Boko Haram” has always been a nickname, though its members and leaders used it themselves. However, in 2014, they changed their official designation to ISWA, Islamic State of West Africa, and stated that from that time on they constituted a caliphate. When I first read about that announcement, I tried to figure out whether it meant that ISWA was establishing its own caliphate under Shekau or aligning itself with the caliphate of Caliph Ibrahim of ISIS. Then I realized that much of the rest of the world also did not know what this new claim entailed either. I suspect that initially Shekau may have thought that of himself as the ideal candidate, but since then ISWA has extended a request to ISIS to become a part of its team, and ISIS has accepted the offer. Sidelight: One can find a number of good articles debunking the idea that the office of "caliph" truly has the great significance that many Muslims and Western analysts tend to ascribe to the term. From my standpoint as a scholar interested in precision, I appreciate such corrections; as a scholar interested in the role of religions in the contemporary world, once again I need to fall back on the fact that perceptions are frequently more important than theoretical accuracy in understanding the actions of people. (See, for example, Madawi al-Rasheed, Carool Kersten, & Marat Shterin, eds., Demystifying the Caliphate (Oxford: Oxford University Press, 2015). In the short report on his studies of Boko Haram in the aforementioned alumni magazine, Professor David Cook, has finally felt free to sound a hopeful, if not optimistic note. After the elections on March 25 of this year, the government finally authorized the military to carry out a full-scale mission against Boko Haram, and has succeeded more so than many people had hoped for. To be more specific, as I understand it, the organization, which by that point was establishing territorial control over parts of northern Nigeria has been driven underground again. "Boko Haram's reign of terror is coming to a close at this time, thanks to a decisive response just in the nick of time," Cook rejoices and adds a little later that "it has been profoundly satisfying to hear that Boko Haram is finally on the run." Given the horrendous state prior to army intervention, one cannot help but to share his joy. Much oppression has been ended, and captives--particularly some of the abducted girls and women--have been returned, though bearing serious scars. But Cook realizes that the hostilities are not over for good, and Boko Haram still exists. Just as I thought about writing on this topic, I came across a report of a Boko Haram sponsored bombing in northern Cameroon. Furthermore, the Wikipedia article on the group contains a rather lengthy list of acts of terror ascribed to them this year, which unfortunately must take us back to a more somber mood. Writing in the context of exploring the options in American foreign policy in reaction to the events of Nigeria, Cook has suggested a rather cautious approach (2011, 23ff, & 2014, 24ff). Since clearly my opinion is far less informed than Prof. Cook’s, the fact that I concur may not carry a whole lot of weight. Our military resources are limited, and we do not have sufficient national interest in the fate of Nigeria as a political entity to get involved in one of their civil wars, even if we find one side quite repugnant. We cannot be the policeman of the world. A veritable crusade to West Africa to right all wrongs and establish a permanent Western-style government and economy would, without a doubt, wind up as disastrous as its counterparts in the Middle Ages. Nevertheless, there are some very good reasons to keep a close eye on what is going to happen in Nigeria in the near future. And, again following Prof. Cook's lead, in case of some scenarios, the U.S. may need to offer aid to Nigeria's army--if we have any resources to offer. 1. Boko Haram, now ISWA, still exists, not just as an idea, but as a group of people who continue to pursue their goal, as made clear by the ongoing acts of terror. 2. Anti-government armies in Africa often are made up of a large number of mercenaries who move from country to country, offering their services to various causes. They provide experience in war in addition to bolstering the numbers of insurgent combatants who are capable with modern weaponry. The experience of Captain X, according to the article I mentioned above is an apparent case in point. Thus, at least theoretically, the number of potential warriors on behalf of ISWA could actually exceed the number of Nigerian members of the group. Given sufficient inducement, ISWA could make a large-scale comeback, in which case the United States may have to get involved simply to continue the “war on terror.” Obviously, I have to leave it with “could” and “may.” Despite the statements of our country’s highest leader in foreign policy, we have yet to neutralize al-Qaeda, making it meaningless to say that we’re going to “do” ISIS in a shorter time frame. Any statements concerning ISWA suffer from even greater uncertainty. 3. We have begun to feel the impact of ISIS in the Western world, including even on our shores. I began this lengthy essay with the observation that ISIS is at the moment territorially restrained, but that it is also still expanding and increasing its influence (and President Obama recognizes both points, at least implicitly). Hopefully you may now be able to see one key to understand this conundrum. ISIS is expanding geographically because other jihadi organizations may (explicitly or implicitly) seek to make common cause with them. I have tried to give an intelligible account of how this method has worked out in one West African country, and there's no good reason to expect it to end soon if it turns out that potentially new members of the intended global IS are receiving benefits from claiming affiliation with ISIS. 4. In the meantime, ISIS definitely gains from such expressions of support. Let me clarify. The most effective strategy for guerilla warfare consists of spending much time in hiding, launching surprise attacks on the enemy so as to inflict maximum damage in a minimal amount of time, and returning to concealment quickly enough that the enemy has little chance to respond. To do so, one must have bases from which one can launch these sorties, and groups such as Boko Haram, even with few facilities, can provide just that kind of opportunity. Is Boko Haram, given its recent losses, going to carry out terrorist attacks in Western Europe or the United States in the foreseeable future? Probably not. In contrast to ISIS, they appear to be short on resources and often look for financial support by means of plain old bank robbery and holding prisoners for ransom. However, if they remain a viable, albeit underground, organization, they can still be of great assistance to ISIS, which has now displayed its capability for destruction on a world-wide level. In short, in my debatable opinion Boko Haram/ISWA considered by itself should not be seen a threat to us here in the U.S. However, since they are probably once again at a point of desperation and presumably continuing to crave a role on the world stage, we need to take it seriously as a relatively new arm of the movement towards a world- wide Islamic State, as currently led by ISIS. Given the rhetoric of the last six or more years, they may very well be available to ISIS as a second-ranked group that is willing to do virtually anything in order to receive acceptance among other Islamic militant groups. Do I mean, then, that the U.S. should send troops along with drones and bombs to Nigeria in order to root out what remains of Boko Haram? Of course not. I don't see where we could contribute anything other than creating a lot of bad will among all concerned parties—governments and insurgents alike—with only a minimal probability of success. If I can make a suggestion, it would only be the obvious one of keeping a close eye on northern Nigeria with a view towards exposing, if possible, significant contacts with other Neo-Kharijite and jahidi groups or a visible influx of potential mercenaries. All of those prognostications aside, my overall purpose here has not been to advise what should be done, but merely to explain one means by which ISIS can increase its power as a global threat. I hope my efforts towards providing a little bit of further understanding have not been entirely in vain.